A map of the "Rock Blocks" Which are your favorite songs? "What do 'Light My Fire', 'Hey Jude' and 'Born to Run' have in common? If you answered that they’re names of iconic rock songs from the 60s and 70s, you are correct! But did you know they're also the names of vineyards in Napa Valley? At Cliff Lede Vineyards there are 46 different blocks of plantings, known as "Rock Blocks," each one named for a famous rock song or album." 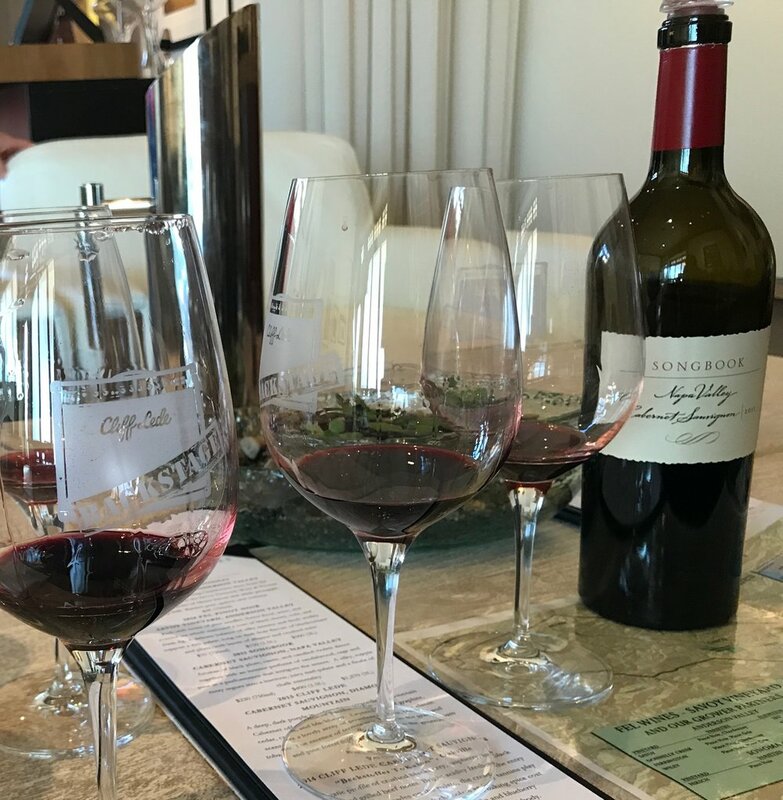 Read the full article on GrapeCollective.com and the next time you are in Napa Valley, a visit to the winery is a must-do. Photographs of rock stars adorn the walls of the lounge. Conveniently located in the heart of the Stags Leap district, right off the Silverado trail, this gorgeous winery not only has serious — as in seriously great! — wine, it's a fun place to visit too. Book a Backstage Experience and you'll be tasting top-notch wine while listening to your favorite rock songs. And if that's not enough, the winery has partnered with the San Francisco Art Exchange to create the "Icons Of Rock And Roll" exhibit, a rotating collection of photographs of famous rock artists, and other related artwork, like album covers. While visiting the winery, notice that on the top of some of the bottles is what looks like a dial with the numbers one to eleven and, on the back label, the words "these go to eleven." This is a reference to the 1984 cult classic comedy "This Is Spinal Tap," a fake documentary about a British rock band whose popularity is going steadily down the tubes. There is a hilarious scene in the movie in which the lead guitarist Nigel Tufnel (Christopher Guest) is showing the documentarian (Rob Reiner) his special Marshall amplifier with knobs that are marked from one to eleven, unlike typical amps which are labelled with ten as the highest setting. Nigel, with his stereotypical shaggy 80s hairstyle, couldn't be more serious as he explains, while chomping on gum, how these unique amps sound louder since they "go to eleven" and giving the band "that extra push over the cliff" when needed. Logical? NO. Funny? YES! Nigel doesn't understand that the 11 is just a label for the highest setting and even if the dial went to one hundred and eleven, it still wouldn't make the music sound any louder. You have to love his innocent optimism — even if it doesn't make sense — and how he views the eleven setting as a way of trying harder, pushing the limits and nudging the amplifier beyond its usual capabilities. At Lede Family Vineyards, the "eleven" reference is a playful nod to the idea that they are making that extra push in their winemaking, going above and beyond what's usually done. Check out some of the great pieces currently on display at the winery. Joey Kramer of Aerosmith's drumsticks. Photo of The Door's Jim Morrison taken by Joel Brodsky, 1967. Storm Thorgerson's cover for The Mars Volta's Frances The Mute album — very cool! Songbook is sourced from two of acclaimed viticulturist David Abreu’s personally-farmed properties: Thorevilos Vineyard, situated between the St. Helena and Howell Mountain AVAs, and Madrona Ranch, nestled in the foothills of the Mayacamas mountain range. Cheers to Lede Family Wines! 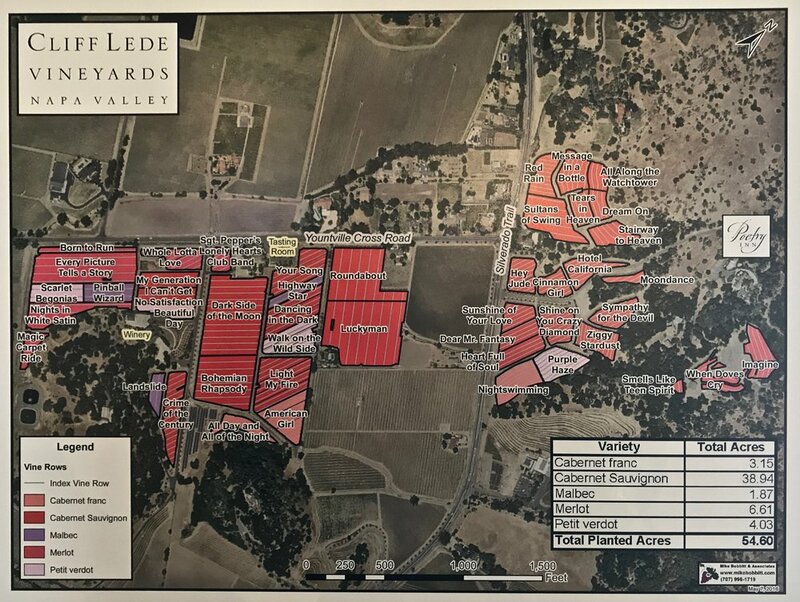 Click here to find out more about visiting Cliff Lede Vineyards.